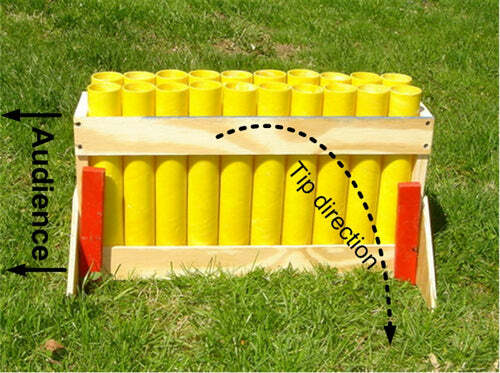 20-shot Fiberglass Firework Mortar Rack Plans — Skylighter, Inc. The Mighty Fourth is closing on us and you haven't even begun designing your fireworks display, right? "I've got plenty of time," you say. And every year, you think to yourself, "Man! I need to buy more mortar racks." 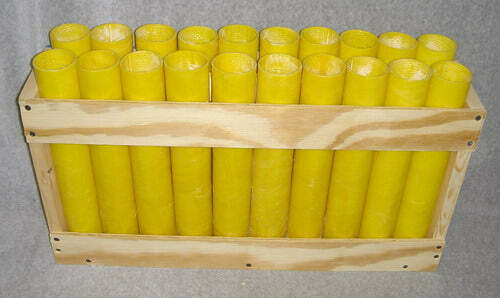 And every year you wait 'til the eleventh hour, and end up either reloading your mortars during the show, or worse, using the cheap cardboard mortar tubes that come with your reloadable shells! Well, why not invest an hour or two right now to get ready? Here's a nice little "do it yourself project" that you can finish in about an hour if you have everything ready to go. This year you can get started early and paint the sky with festival balls the night of the Mighty Fourth of July! Baseboard: 1 pc. 1 x 5 plank, 23 inches long. 1 x 2 furring strip center rails while attaching to base. Next, install the center rails. Place one of the 21.5 inch furring strips on its edge, directly in the center of this base (see figure A). It's helpful to lay the base on its side and use several tubes as spacers to support this bottom center rail. 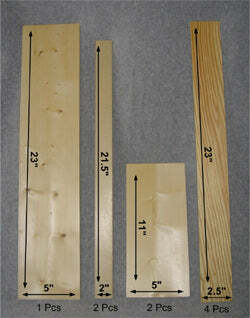 Then attach the rail by screwing through the ends and bottom, as shown in figure B. Attach the top center rail frame as shown in figure A, screwing into it from the end boards. Check your spacing. You should now be able to place mortar tubes on either side of the center rails with the edges of the mortar tubes flush with each edge of the base board as shown in figure C.
Attach upper and lower side rails. Stand your mortar rack up on its base (see figure C). Screw one of the 2-1/2 x 23 plywood side rails to the base and end boards as in figure D. Once the lower side rail is screwed in place, attach one side of the upper side rail flush with the top corner of one end board as shown in figure E. If the rack is not completely square, pull in the opposite end flush with the side rail to square the sides--attach that end. 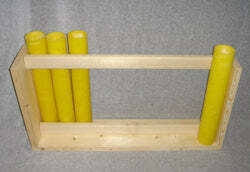 Flip your mortar rack and attach side rails to the other side as well. Test fit the tubes in the finished frame. They should fit snugly, but you should be able to remove them for cleaning later on. The mortar rack you just finished may feel stable on a perfectly level, flat surface. But it will need to be supported when it is in use. This can be done by adding support legs or braces to the ends of the mortar rack, or staking the mortar rack in place, or screwing several mortar racks together to form a larger footprint. It's not important how you secure your mortar racks, just that you do secure them. The orientation of your mortar rack to the audience is critical to their safety. 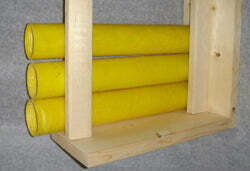 If a shell explodes inside a mortar tube, it will tend to blow out the weakest part of the mortar rack. The weakest part of this rack are the plywood side rails. And if the side rails are blown out, this could mortar tubes to fall over. So, it is important to orient your mortar rack so that any falling tubes would be aimed away from your audience. This prevents mortar shells from being fired directly into the audience, which can be very dangerous. Therefore, when you set up your display, orient your mortar rack so one end board is facing the crowd. See figure F below. Figure F: Safest mortar rack orientation toward audience--perpendicular to them. In the event of a failure the mortar tubes will fall parallel to your audience. 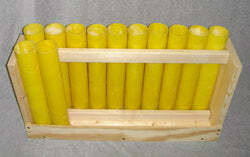 Note stabilizerson each end and stakes holding the mortar rack in place. Although our tests with smaller bore artillery shells in our firework mortars did not produce any low breaks, it is always possible with other artillery shells. And different makers and batches of artillery shells can have differing amounts of lift charge. So just for the record, our firework mortars actually have a 1.93-inch inner diameter. So this tube should accommodate just about any Chinese Class C artillery shell on the market. But you should test any Class C artillery shells you are going to fire out of them first, just to make sure you get a good, safe burst height. Also using a mortar that is too tall for the fuse length on the artillery shell is a real pain. One B-Cat mortar is 18 inches in height. Our mortars are 14 inches tall, with about 12-3/4 inches of depth. Be sure your fuse is longer than 13 inches.